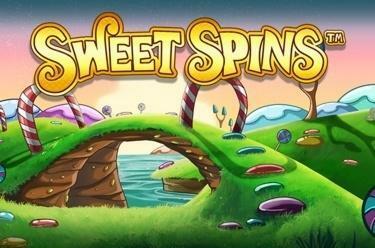 Play Sweet Spins™ online for free now! Winning has never been this sweet! At Sweet Spins™ you must make your way across mountains of sweets and past countless candy trees to find the delicious treasure. During your journey, you’ll be served up treat after treat, from tasty pastries to colourful gumdrops to creamy ice cream on up to 25 win lines. But you won’t be alone - a beautiful lady will accompany you and, acting as a Joker, she will replace any symbol to help you on your way. The one exception is the Chocolate wrapped in gold paper, for this is the key to the lucrative free games! Your sweet aim with Sweet Spins™ is to line up 5 matching symbols side by side along the win lines. In the regular game, the winning pattern begins on the first reel on the left and continues across the reels to the right. In order to win, the winning symbols cannot be interrupted by other symbols between them. 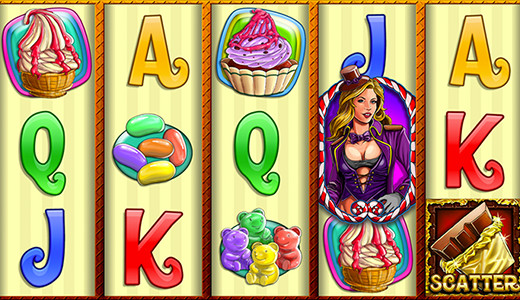 The Lady replaces every other symbol in the game to complete your winning combination. 3 Chocolate Bars or more trigger free games with additional Joker symbols! With 3, 4, or 5 Scatter symbols (Chocolate symbols) you get access to the land of milk and honey because they trigger 5, 10 or 25 free games! Previously 1 to 2 letters (A, K, Q, J) or sweets (Jelly Babies, Jelly Beans, Ice Cream, Muffins) will be picked randomly - they turn into Joker symbols and replace any symbol just like the Lady. The exception is the Chocolate symbol that will grant you additional free games if 3 land in any position on the reels during the free games. The free games will use the settings of your last regular game.